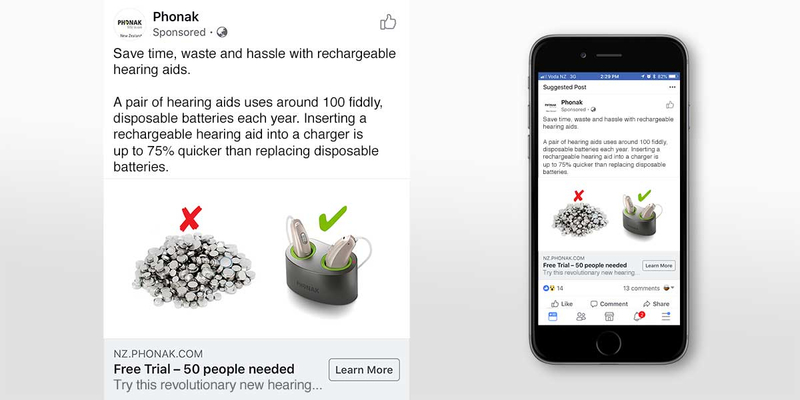 Client: How do we build leads for our rechargeable hearing aids? 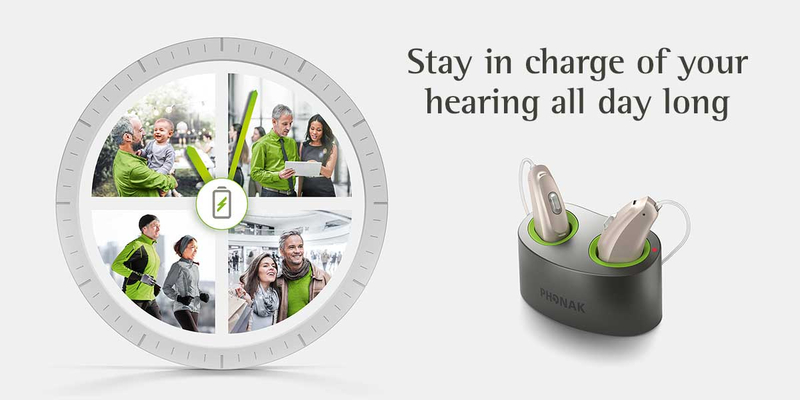 Phonak continuously challenge the limits of technology and their latest advance is Phonak rechargeable technology – the quickest charging, longest lasting rechargeable hearing aids. 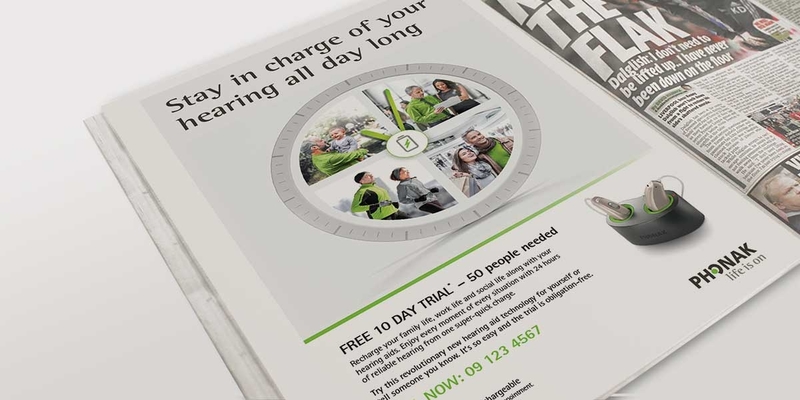 We were briefed by Phonak New Zealand to create a lead-generation campaign for their newly launched rechargeable hearing aids. 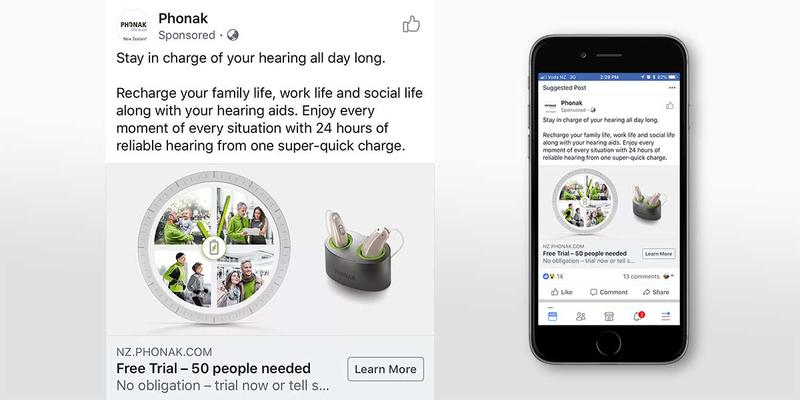 The target audience being existing hearing aid users, who are likely have hearing aids with traditional exchangeable batteries. The preferred channels to reach this audience were a combination of Facebook advertising supported by traditional print advertising executions. Step 1: We discussed the brief with Phonak and we looked at the key benefits of their new rechargeable hearing aid technology. 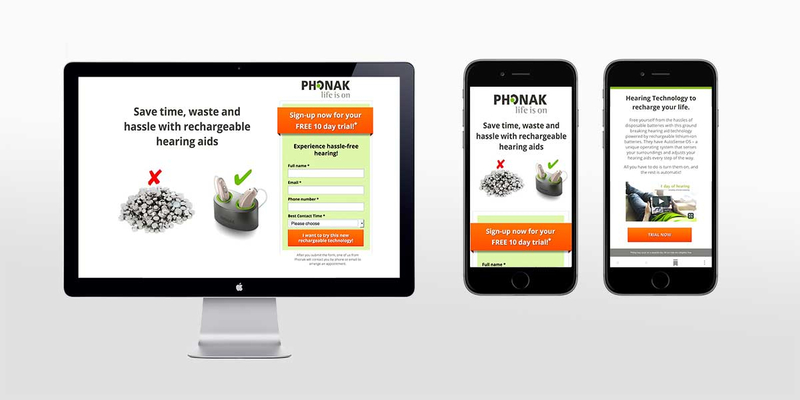 We also read a new research paper written locally by Phonak’s Brand Manager and Audiologist, which tested and proved some of the convenience factors of rechargeable vs disposable batteries in hearing aids. Step 2: We explored multiple creative concepts that expressed the facts and benefits we had been provided with in appealing ways. Initial visuals were created to show life-like representations of the finished adverts. All concepts were presented to the client. 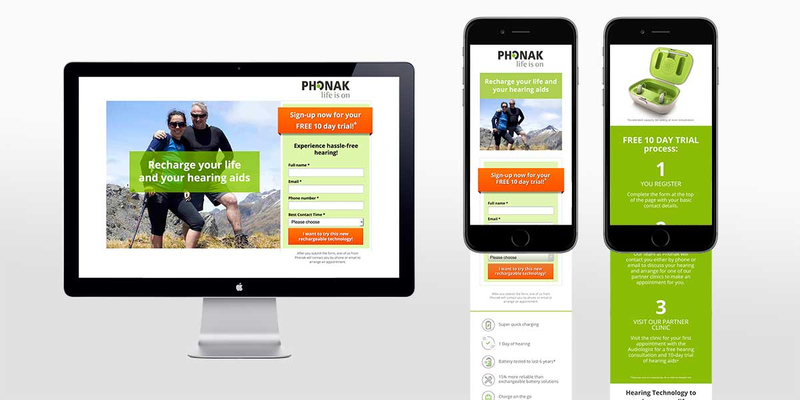 Step 3: The campaign imagery and the messaging of the preferred concepts, were refined and re-presented to Phonak, to ensure that they would work effectively as Facebook advertising, linking to campaign landing pages and print advertising. 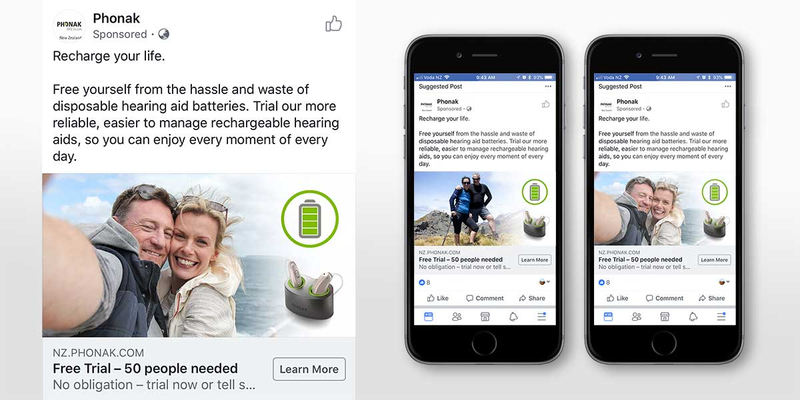 Step 4: The decision to run 3 Facebook advert variations was made, so our next task was to finalise the creative content for these campaign variants: the text, images, headlines and descriptions, according to Facebook’s Single Image Advert specifications. 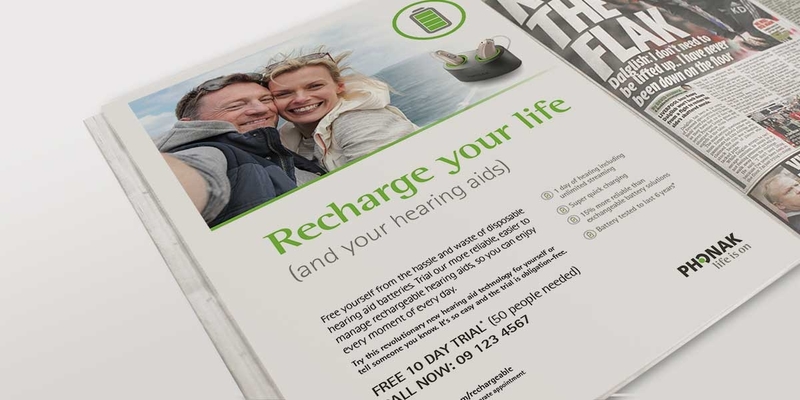 The headline offer was an no-obligation, 10 day free trial of a rechargeable hearing aid. Step 5: Next we designed a new landing page template for the Facebook advertising to link to and capture new leads. A prominent form took care of the data collection from new leads. 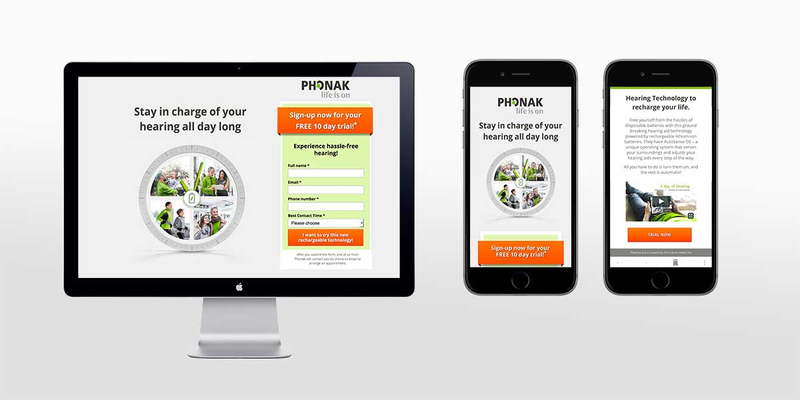 Campaign imagery was supplemented on the landing pages with additional product photography, product benefits and one of Phonak’s rechargeable product videos. The landing pages expanded on the 10 day free trial process and the products themselves. Step 6: With the digital executions completed, we then designed print adverts for each of the 3 campaign variations. All our solutions stemmed from the idea ‘Recharge your life’. 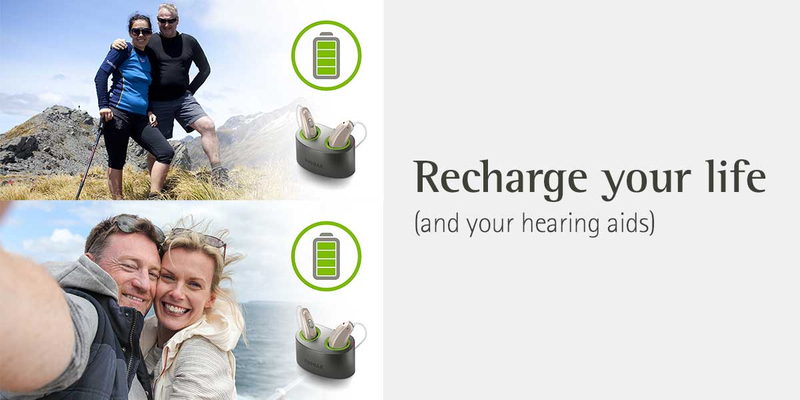 Phonak’s rechargeable hearing aids are designed to simplify your life. 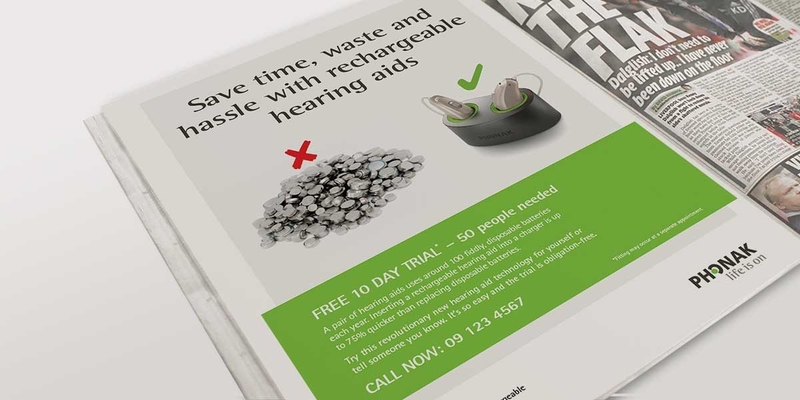 Hearing aid users can finally free themselves from the hassles of disposable batteries. One quick charge gives a day of hearing including unlimited streaming. No more changing fiddly disposable batteries (once a week). 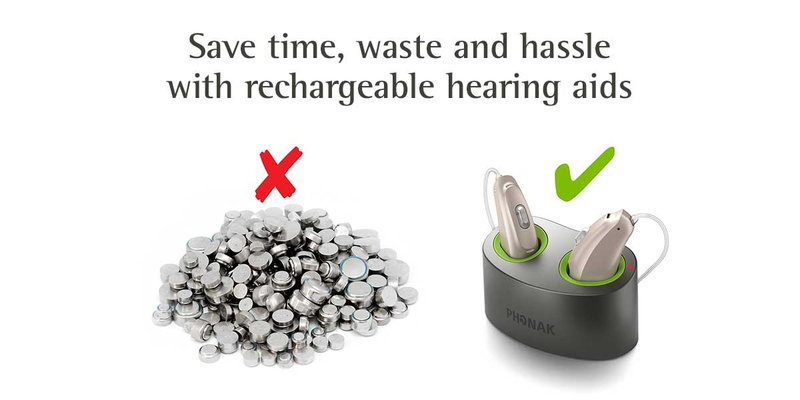 As well as avoiding hundreds of wasted disposable batteries over the lifetime of the hearing aids, Phonak’s rechargeable solutions save time (a fact proven in Phonak’s research paper). Our take was that these convenience factors allow you to recharge your life – to enjoy every part of every day, whether it’s your work life, family life of social life. Apart from the obvious facts above, we’ve also identified that one of the Facebook advert variants is outperforming the others by far (generating 76% of the new leads), over 100 likes and / or emoticons and more than 50 comments. Comments include tagging people and sharing the advert, which is highly encouraging. This provides great learning for future campaigns. In terms of converting leads into appointments (the starting point for the 10 day free trial offer), initial data shows that about 60% of the new leads contacted so far have consented to an audiology appointment. This is about twice the percentage that Phonak have achieved with previous campaigns. These interim results combine to give a relatively low cost per lead for potentially high value sales post 10 day trial. The campaign will run until July 2018 and we’ll be watching closely to see how many actual sales are created from this campaign. Need help with an advertising campaign? Do you need an experienced advertising team? We help businesses to promote their products, services and experiences through digital marketing channels and traditional print media channels. Angle’s team create effective advertising that gets you noticed and makes the most of your promotional budget. Find out more about our advertising services here.